Looking for educational toys? We know that almost any toy can be educational, but here you'll find a variety of toys designed especially to help teach and reinforce language arts skills, including reading, spelling, grammar, and writing. The toys listed here will not only educate, but keep learning fun. When you're done here, be sure to check out some fun educational spelling games, reading games, and grammar games. Place the colorful wooden letters in their proper places to spell words on the cutout 16-sided wooden boards. 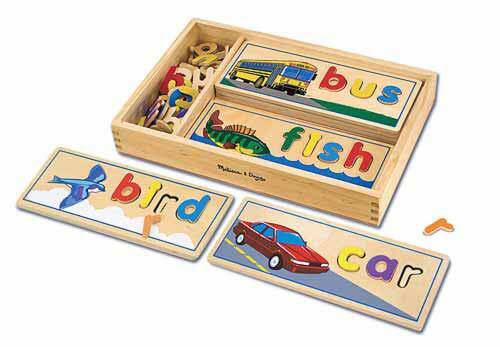 Melissa and Doug See & Spell includes sixteen playful pictures with three and four letter words keep learning fun! Ages 4 and up. 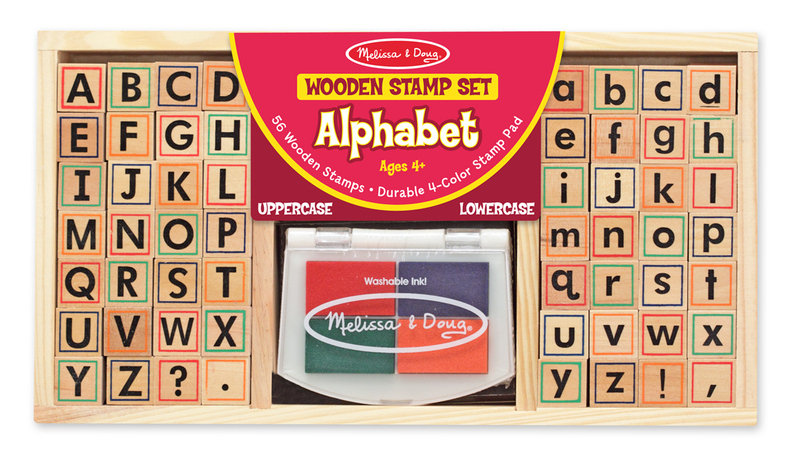 Write exciting messages with this organized wooden Melissa and Doug Alphabet Stamp Set . It includes 56 letters (upper and lower case), punctuation marks, and a 4-color stamp pad. More ways to play and learn: Have your child to name the letters while placing the stamps in alphabetical order; match upper and lowercase letters in pairs; count the letters in the alphabet; or create letter patterns; or use to practice spelling words. Ages 4 and up. Reading Rods Activity Sets by Learning Resources make reading and writing practice fun at home. Sets include reading rods, activity cards, an activity tray, a dry-erase board, and washable dry-erase pens & erasers, all packaged in a durable, easy-to-clean soft vinyl binders. You'll find a letters and sounds kit, phonics set, word building set, and sentence building set. 1st Grade and up. Spellingmaster is a unique learning center that teaches spelling. It consists of a spelling tray with an attached chalkboard, wood tiles with individual letters and spelling picture word cards. A word is spelled by copying the word card. Letter tiles are placed in the correct sequence in the spelling tray. The word is studied, then the doors are closed. The child writes out the word on the chalkboard from memory. Correctness is checked by lifting the doors and matching the letter tiles to the handwritten word. There is also a lowercase alphabet add-on set available. Ages 3–6. Kids master rhyming sounds as they match word tiles to adorable houses…and drop them in through the windows! Each sturdy chipboard sorting house has a word printed on front, with a cute picture clue that helps kids identify the rhyming sound. When kids are done, they can open the magnetic roof to take out the tiles and check their answers against the words printed on back! Ages 3–6.